Frederick Harvey Jacoby was born on 14 August 1922 in Niagara Falls, Niagara County, New York. Otto Julius Jacoby and Marie Katherine Kammerer appeared in the New York state census of 1 June 1925 in Niagara Falls, Niagara County, New York, at 1620 Ontario Avenue. Other members of the household included Frederick Harvey Jacoby, John Otto Jacoby, Elizabeth Marie Jacoby and Mary A. Kempf. Otto Julius Jacoby and Marie Katherine Kammerer appeared in the US federal census of 1 April 1930 in Niagara Falls, Niagara County, New York, at 952 Vanderbilt. Other members of the household included Frederick Harvey Jacoby, John Otto Jacoby, Elizabeth Marie Jacoby and Robert Carl Jacoby. Marie Katherine Kammerer appeared in the US federal census of 1 April 1940 in Niagara Falls, New York, at 952 Vanderbilt. Other members of the household included Frederick Harvey Jacoby, John Otto Jacoby, Elizabeth Marie Jacoby and Robert Carl Jacoby. Also in the household was one female lodger. He graduated from DeVeaux School in the class of 1940. Elizabeth and Frederick Jacoby were photographed about 1942. Frederick Harvey Jacoby died on 1 July 1945 at age 22 in Lamb County, Texas, in an air crash while serving as a 1st Lieutenant and pilot in the U.S. Army Air Corps. He was interred at Fort Sam Houston National Cemetery, San Antonio, Bexar County, Texas. The following appeared on 3 July 1945 in The Niagara Falls Gazette: First Lieutenant Frederick H. Jacoby, 22, son of Mrs. Otto J. Jacoby, of 952 Vanderbilt avenue, was one of five persons killed when a C-47 Army Transport plane crashed and exploded near Olton, Texas, Sunday, according to an Associated Press dispatch from Lubbock, Texas, last night. Only meagre details of the fatality were released by the public relations department of the Lubbock, Texas airbase, from which the plane took off prior to the crash and explosion. Lieutenant Jacoby was a graduate of De Veaux School and was a cadet officer in the school. He won a scholarship to Hobart college while at De Veaux. He enlisted in the Army Air Forces in November, 1942, and trained at airbases in Texas and the midwest. 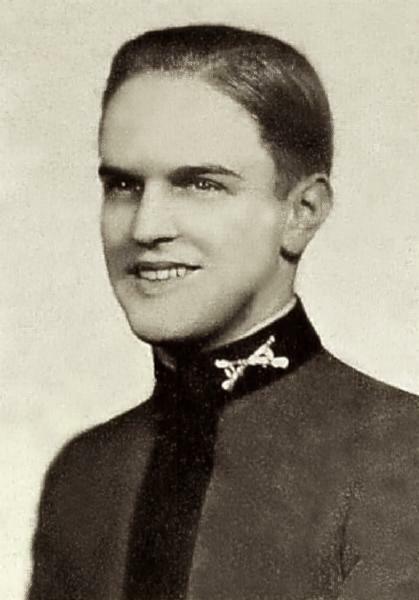 Surviving him, beside his mother, are three brothers, Lieutenant John O. Jacoby, a navigator in the Army Air Forces, now stationed at a Louisiana airbase; Robert Jacoby, who is studying for the ministry at the Columbus, O., Theological institution, and Richard Jacoby, at home, and one sister, Elizabeth, also at home. Mrs. Jacoby was informed of her son's death in a message from the Lubbock airbase commanding officer last night. She is awaiting further details concerning the tragedy today. Lt. Frederick H. Jacoby, pilot; mother, Mrs. Marie Jacoby, 952 Vancerbilt Ave., Niagara Falls, N. Y. . . .
All the men were stationed at Brownsville Army Air field and the WAC, believed to have been a passenger, at Fort Sumner, N. M. Next of kin of all victims have been notified. The twin-motored C-47 transport crashed at 5:20 o'clock on the Shaw farm three and a half miles northwest of Spring Lake. The plane fell in about 400 yards of the Shaw residence. LAAF officials said that all who saw the plane just before the crash reported that the ship appeared to be "in trouble" and finally went into a steep dive. The impact left a crater more than big enough to drive an automobile into, witnesses said. The transport exploded and burned as it hit the earth. Pieces of wreckage were strewn over a wide area. A LAAF officer said the plane had left St. Louis Sunday morning; had landed at Majors Army Air field, Greenville, Tex., Sunday afternoon, and was en route to Fort Sumner, N. M., Army Air field when the accident occurred. The plane's home station is at Brownsville, an Army Air Transport command base. The bodies were brought to Rix Funeral home, the firm said last night that no directions had been yet received for shipment of the bodies. The following appeared on 7 July 1945 in the Niagara Falls Gazette: A memorial service was held in St. Ambrose chapel, DeVeaux School, Lewiston road, yesterday afternoon, for First Lieutenant Frederick Harvey Jacoby, 22, of this city, who was killed when a C-47 Army Transport plane crashed and exploded near Olton, Texas, last Sunday. Among the hymns at the request of the family was "Abide With Me." The Bible lesson and prayers were offered by the Rev. William S. Hudson, headmaster of DeVeaux School. H. Proctor Martin was at the organ. Many relatives and friends of Lieutenant Jacoby attended, including his mother, Mrs. Otto J. Jacoby, of Vanderbilt avenue; three brothers, Lieutenant John O. Jacoby, in the Army Air Forces; Robert Jacoby, a student at the Columbus, Ohio Theology institute, Richard J. Jacoby, at home, and a sister, Elizabeth, at home. A graduate of DeVeaux School, Lieutenant Jacoby entered the cadet training program in November, 1942, and received his wings in the fall of 1943. Since then he has been piloting planes of various kinds for the army.